VANCOUVER, BC - There is now a sufficient threshold of prima facie evidence to reasonably conclude that that the Calgary floods of June 2013, which are estimated to cost billions in property damage and affect the Canadian economy as a whole, were in fact an act of environmental warfare in the form of an intentional weather warfare attack against the people of Calgary, Alberta, Canada and environs. Environmental warfare is banned under the 1978 Convention on the Prohibition of Military or Any Other Hostile Use of Environmental Modification Techniques (ENMOD), to which Canada, the United States and Russia are all parties. "Firstly, we are surprised that none of the major media outlets have mentioned that the heavy rainfall southern Alberta received in the past two days originated from southern Montana. We will describe how the recent weather pattern formed, which brought majority of the recent flooding of rain, accompanied by videos. A playlist of all events can be viewed here. Part II discusses mainly Calgary and surrounding areas in south Alberta, strictly using the Pacific and Prairie radar stations data. Read Part II here. "Regarding the video below, pay close attention to the storm originating in southern Montana which moves into southern Alberta. At about 11 seconds in, we see a tapering arm stretching south to the Wyoming-Idaho border, which later feeds the southern end of the storm for some time. This storm system moves east to join other storms that originated in North and South Dakota. Also pay attention around these areas of North and South Dakota, to see how storm systems mysteriously originate from central points. It is important to note how some of these storm systems are tapered , originating from a central point. These central points will later be shown to be NEXRAD (Doppler) sites, which can emit electromagnetic waves at different frequencies that affect weather patterns." Part I can be read here, which discusses how the storm originated in Montana. Here is a loop playback of the prairie Doppler radar stations, showing that the storm system is actively being driven up north by various Doppler stations into southern Alberta, where the flooding worsened. We can see that this storm system is clearly coming up from Montana. The Pacific view of the Doppler stations can be seen here. The full playlist of all videos can be seen here. 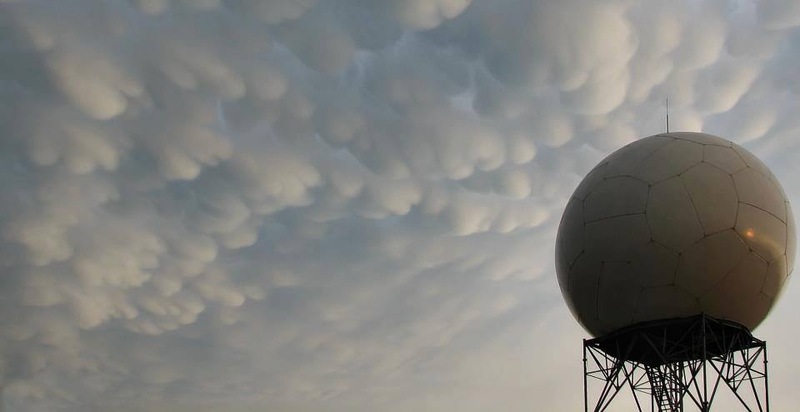 Most Albertans know that natural cloud systems (<< see video) are driven from West to East, however, this storm system was steered north, originating from south Montana, using NEXRAD / Doppler stations. 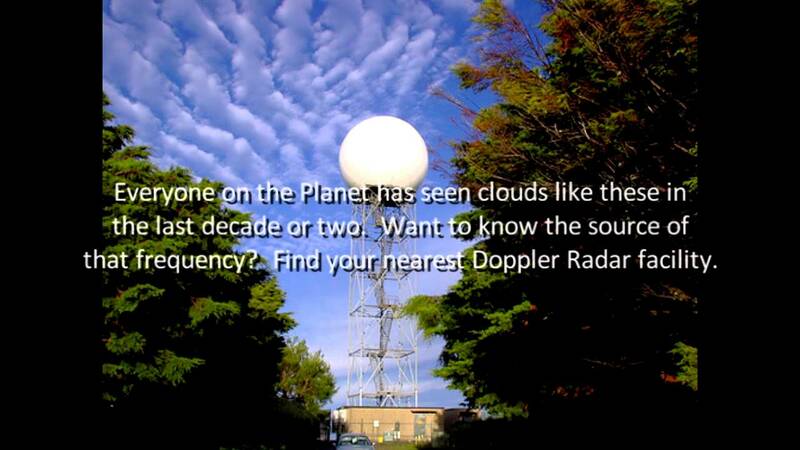 Here are some recently found Doppler stations near Calgary, not to mention there is also one north of Strathmore. Their influence on these storm systems can clearly be seen when one observes different sets of radar animation data. 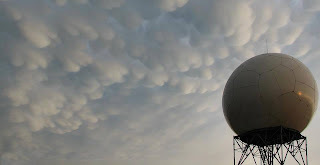 Here is an video of Doppler stations moving the storm system from east to west on June 20th. Here are photos of how the Calgary sky looked after the clouds parted and heavy rainfall desisted, taken in order throughout the day. Another set can be found here. Many signs of the Doppler effect can be seen in these photos. With signs of aerosol deployed throughout the sky, and NEXRAD (Doppler radar) influence on metallic-laced clouds, this is the aftermath of a Geoengineered storm. Here is a playlist of all unusual weather phenomenon (video footage) linked to this event. 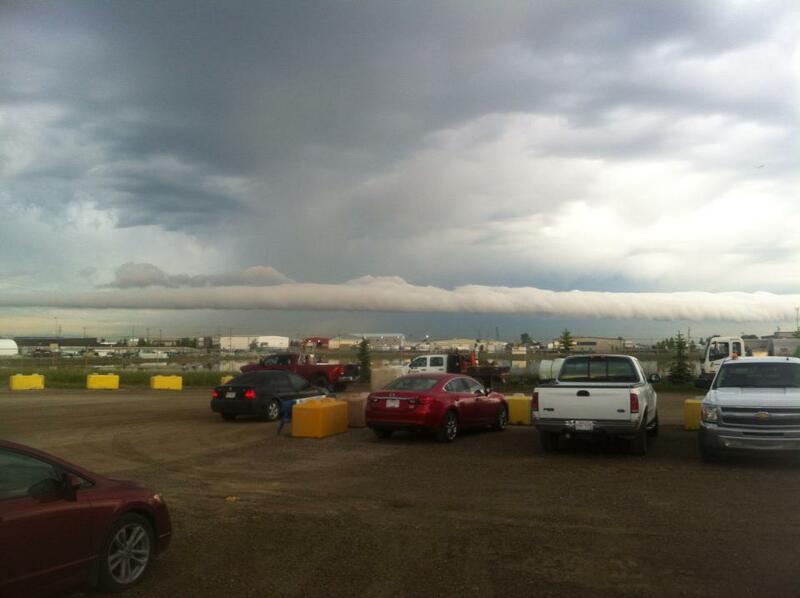 Here is a recent video caught by a user on June 18th, regarding an unusual cloud formation which is pictured below. Calgary, AB - June 18: Unusual cloud formations have been reported by residents from southern Alberta, which seems to correlate well with what has been described regarding the Geoengineering of this storm system. Satellite / Radar images: Why is the mainstream media not discussing the large amount of rainfall that originated in Montana, where NEXRAD / Doppler radar stations steered the storm north into southern Alberta? By whom and for what purposes was the June 2013 Calgary Environmental War false flag attack carried out? 4. To assert North American supremacy of the United States over Canada in a forthcoming attempt to integrate the United States and Canada in a North American Union. 5. To manipulate public attitudes and public policy regarding legislation needed to deal with the effects of "global warming", falsely attributable to Environmental war events like the June 2013 Calgary floods. To date, Canadian mainstream media have avoiding publishing any available forensic evidence that the June 2013 Calgary floods may have been Environmental warfare, despite the ready availability of such evidence. Likewise, Canadian officials at the level of the Federal government, including Prime Minister Stephen Harper, Minister of National Defence Peter MacKay, and the Minister of the Environment Peter Kent have all avoided making public statements about the forensic evidence that the June 2013 Calgary floods was an act of Environmental war, despite the fact that there is prima facie forensic evidence that Canada was subjected to hostile and damaging attack in contravention of the 1978 ENMOD Treaty to which Canada, the U.S. and Russia are signatories. The public silence of Canadian mainstream media and of the Canadian Federal Cabinet and political party leaders about an apparent major environmental war attack on a major urban center, if not corrected by both reponsible members of the mainstream media and of the Canadian cabinet and Parliament and government of Canada, constitutes a gross breach of public trust that has no precedent in recent Canadian history. Alfred Lambremont Webre, JD, MEd is a Judge on the Kuala Lumpur War Crimes Tribunal and may be reached at [email protected]. To date I have not received a single response to my email on this subject. Have you had any feedback at all?